Castellón (Spanish) or Castelló (Valencian/Catalan) is a province in the northern part of the Valencian Community, Spain. It is bordered by the provinces of Valencia, Teruel, Tarragona, and the Mediterranean Sea. Its capital is Castellón de la Plana (ca: Castelló de la Plana). The province has a population of 501,237 (2002), of whom 30% reside in the capital, 60% in its metropolitan area and 85% in the coastal line. It is a bilingual territory, with almost all inhabitants speaking Spanish, and many also speaking the regionally-wide co-official Valencian. Alcocéber - on the Costa Azahar (Orange-blossom Coast). Enjoyable harbour and beaches. 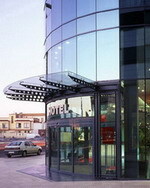 The Hotel Alcoceber is a modern, holiday hotel located within 200 metres of Alcoceber's many beaches and 300 metres from the marina and shops. For those that want to check out some places of outstanding beauty, the Sierra D'Irta and the wetlands of L'Estany, one kilometre from the hotel, are recommended. The Restaurant Mediterraneo provides guests with dishes derived from Mediterranean cuisine and available from an a la carte menu. A buffet restaurant also serves Mediterranean snacks and well-known dishes and guests can dine on the hotel's outside terrace that overlooks the sea and swimming pool. Drinks and cocktails are available from the hotel's bar and guests can relax in the hotel's spacious hall where sofas and coffee tables are provided. 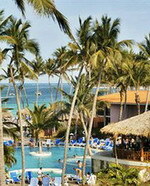 The swimming pool itself is lagoon-style and the surrounding area features palm-trees, sun-beds and parasols. Entertainments staff are also on hand to organise activities for the kids such as games and shows. Benicarló - has a distinct Mediterranean character and is not too touristically crowded. 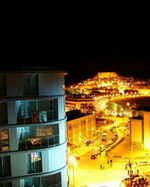 Benicarlo is both a modern city with its industry and tourism and a traditional seafaring town. Benicàssim - a port town and beach resort located in Castelló, on the Costa del Azahar in Spain. It is located 13km north of the town of Castelló de la Plana, on the north of the Valencian Community. The town is famous for the Festival Internacional de Benicàssim, one of the most important summer indie music events in Europe. The Hotel Intur Azor is located 50 metres from the beach of Benicasim and in an unbeatable natural environment for the guests to enjoy. The hotel facilities include a cafeteria, restaurant, social lounge, swimming pool, gardens, car park, padel court, grass football pitch, mini-golf and its SPA centre, ideal for relaxing by the sea. On the left you will find the social lounge, a quiet and well-lit space where you can relax, read or have a quiet chat. On the right you will find our minimalist cafeteria and the entrance to our restaurant specialised in Mediterranean cuisine. The hotel provides space and comfort in its 88 rooms, equipped with a full bathroom, hairdryer, satellite TV, air conditioning, heating, mini-bar and terrace. The Hotel Intur Bonaire, with its 83 comfortable and spacious rooms offers its guests maximum comfort in the most beautiful natural and homely surroundings. 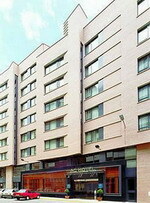 With the comfort of a four star hotel, it has a jacuzzi, gym, sauna and meeting room. Given its prime location, it is the perfect place for meetings that require a quiet setting near the city. Its location and facilities enable you to practice sporting activities so as to combine active tourism with relaxation. The Hotel Intur Orange is located in the residential area of Benicàssim, a few metres from the beach and the Costa de Azahar and 10 minutes from the town of Castellón. Among other services that will make your stay pleasurable, the hotel offers a restaurant, a bar, 3 swimming pools, entertainment and many sports facilities such as padel courts, mini-golf, grass football pitch, etc. 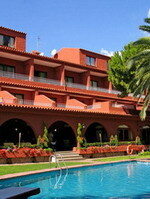 250 metres from one of the best fine sandy beaches of Benicàssim. Huge spaces and gardens where its paradise pools. You will be surprised by this hotel with its modern interior design. Its large gardens offer a real feeling of peace and quiet, combined with the fun provided by our entertainment service. 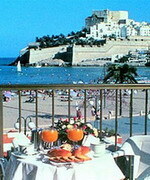 Our restaurant, “El Galeón” is specialised in Mediterranean cuisine. Perfect balance between business and relaxation. Castellón - As capital of one of the most mountainous provinces in Spain, yet bathed by the Mediterranean along its 112 km of coastline, Castellón is a forward-looking city in which broad, modern avenues and narrow streets and plazas from yesteryear combine to form a special atmosphere. A walk around town is a pleasant experience. On your stroll, you can find many pleasant surprises: beautiful modernist buildings, modern shops, shady parks and important Gothic and Renaissance monuments. A modern hotel, the AC Hotel Castellón is centrally located just two kilometres from Castellón's port, and 10 kilometres from fine beaches. The Grao de Castellón Port is two kilometres away and Benicassim's beach is 10 kilometres from the hotel. After a day's sightseeing, guests can have a quiet drink or light meal at Bar AC. Complimentary newspapers are available in the lobby, and business guests are well catered for with a technology helpdesk, business services, two conference rooms, and wireless Internet in public areas. Practical amenities include 24-hour room service, garage parking, and a safe-deposit box at the front desk. The Sala Restaurant, with its stylish minimalist furnishings, offers creative Mediterranean dishes and fine Spanish wines and is open for breakfast, lunch, and dinner. 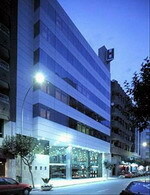 Located in front of the train and bus station, five minutes walking from the Castellon city centre and a few minutes from the main roads of the city, is placed this four star hotel, modern functional and adapted for leisure and business needs. The hotel offers parking for clients with more than 100 spaces, with direct access to the rooms, gym, business centre and sauna, complete the wide range of services and facilities available in the Luz Castellon Hotel. The hotel also has a cafeteria service. Restaurant 'Agua' - Purity in the shapes, in the flavours, smells and textures of a personal and traveller cuisine, respectful and funny, that surprises and renews with the aim to make you enuoy in every moment the quality of our products, chosen daily among the best of our markets. This contemporary glass-fronted property is located in Castellon's commercial district, 400 metres from the restaurants, theatre and basilica. Guests arriving by car find a parking garage; further provisions include room service at mealtimes, tour assistance and valet parking. Valencia Airport is a 50 kilometre drive away. The La Albahaca restaurant serves Mediterranean dishes and is open daily for breakfast, lunch and dinner. The dining room is modern, with pale wood flooring, white leather chairs and white linen-topped tables. Guests have access to an additional restaurant at Hotel Jaime I, which lies across the street from this hotel; Los Narajos serves Mediterranean food in an airy dining room with floor-to-ceiling windows and deep blue armchair-style chairs. The hotel offers guests use of the sauna, hot tub and gymnasium; massage can be booked and enjoyed either in the health centre or in guestrooms. Peníscola (Peñíscola in Castilian) is a Valencian municipality located on the Costa del Azahar along the eastern Mediterranean coast of Spain in the province of Castelló. It is presently a tourist destination for Northern Europeans in search of some sun. Peníscola, often called the Gibraltar of Valencia, is a fortified seaport, with a lighthouse, built on a rocky headland about 220 feet (67 m) high, and joined to the mainland by only a narrow strip of land (Peníscola is a local evolution of Latin peninsula). Built originally between 1294 and 1307 by the Knights Templar, in the fourteenth century it was garrisoned by the Knights of Montesa, and in 1420 it reverted to the Crown. From 1415 it was the home of the schismatic Avignon pope Benedict XIII (Pedro de Luna), whose name is commemorated in the Bufador de Papa Luna, a curious cavern with a landward entrance through which the seawater escapes in clouds of spray. 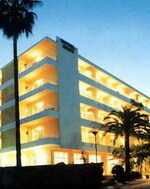 Hotel Agora is a modern spa hotel located in Peniscola, Spain, 400 metres from the old town and Peniscola Castle. The historic village of Sant Carles de la Rapita is 33 kilometres away. The Irta Mountain range is within 15 kilometres of the hotel, and has 90 kilometres of mountain biking and hiking routes. The nearby beach offers a range of water sports. The hotel's spa centre offers a range of massage and beauty treatments, and houses a sauna, steam room, swimming pool, and gymnasium. Further amenities include a kids' club, hair salon, and 24-hour front desk. Hotel Agora serves breakfast every morning, and the restaurant serves Mediterranean rice and fish dishes. Internet access is provided in public areas for a surcharge. Conference rooms have audio-visual equipment. Husa Los Delfines is located on the beachfront in Peniscola, Spain, with views of the town's ancient walls across the bay and the 13th-century castle where Pope Benedict XIII ('Pope Luna') lived. The Moorish old town and the harbour are 500 metres away. 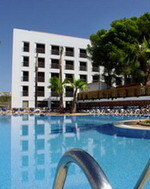 The hotel is located right on the seafront and has an outdoor swimming pool. The sunbathing terrace is edged with palm trees. Husa Los Delfines has a terrace restaurant serving Mediterranean dishes, open for buffet style breakfast, lunch and dinner, as well as a pizzeria overlooking the sea and a coffee shop. The 73 guestrooms have balconies with sea views, televisions, direct-dial phones and safes.